Jonesy is made up of 5 unique personalities from the Niagara Region. Although only in their 30’s, these boys are veterans when it comes to the music scene. 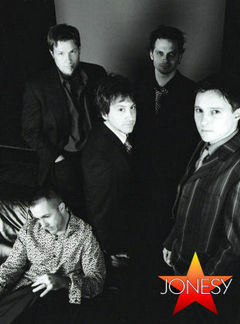 From classics like Rod Stewart’s “Maggie May” to modern rock anthems like Coldplay’s “Yellow”, Jonesy, a popular 5-piece band, plays a wide variety of hits from an impressive repertoire. Each member has been involved with various musical projects throughout their lives, some starting at a very young age. From old classics to modern rock anthems & dance hits, Jonesy plays a wide variety of music that pleases the masses. They are also constantly adding the biggest hits on the radio to their impressive repertoire. “Jonesy” has become a “buzz” word across the Golden Horseshoe and at OLG locations such as Casino Niagara and Niagara Fallsview Casino & Resort where they perform on a regular basis.